Facts about Indian Runner Ducks. The Indian Runner Ducks were found South East Asia on Indonesian islands of Lombok, Bali and Java where most of them are 'walked' to the market to be sold for meat or as egg-layers. The Indian Runner Duck is one unusual domestic duck breed that has a lot of history to study. The Indian Runner Duck often stands erect just like the penguins. When the Indian Runners Duck are in motion they appear to be running and not waddling. The ducks often vary in weight ranging from or 3 to 5 lbs (1.4 to 2.3 kg). Their height often ranges from about 20 inches (50 cm) for small females to or 30 inches (76 cm) for taller males. The Indian Runner Duck eggs always has as greenish-white color. A female Indian Runners duck often lay 150 to 200 eggs in a year or even more, depending on their exhibition or the utility strains. The Indian Runner Ducks don’t fly and only form nests to incubate eggs. The Indian Runner Duck can run or walk and sometimes can drop their eggs when care is not taken especially those breeding them. Duck-breeders need to construct a house for their birds. This is so breeders can protect the Indian Runner Duck and their eggs from other preditors. A Indian Runner Duck egg has twice the nutritional value than a chicken egg and will stay fresh longer because of their thicker shell. Indian Runner Duck eggs are richer with more Albumen "the white of an egg" making pastries and cakes richer and fluffier. A Indian Runner Duck Egg has more Omega 3 fatty acids than a chicken egg. Omega 3 is thought to improve skin health, memory and Brain health. Indian Runner Duck Eggs are an Alkaline producing food and a Chicken egg is an acid food and leaves your body more acid. Indian Runner Duck eggs are high in Cholesterol. Duck eggs have 6 times the Vitamin D and 2 times the Vitamin A than a chicken egg. Indian Runner Duck eggs have 2 times the cholesterol than a chicken egg. The Runner duck has also become very popular in America and Europe as one egg-laying duck that many people often eat when trying to improve their health. The Indian Runner Duck like swimming in streams and ponds, but mostly preoccupied when running around in grassy meadows when looking for slugs, catching flies or eating worms. Most of the Indian Runner Duck do appreciate open spaces so they can relax during sunny days. The Indian Runner Duck do not fly and make less noise when compared to other breeds of call ducks. Only the female Indian ducks quack. This makes them one of the best ducks to keep as a pet because they are not very noisy. The male Indian Runner Duck will guard their nest by chasing away other ducks. Once the female Indian Runner Duck lays 5 to 10 eggs, she will start to sit on her eggs to keep them warm so that they can hatch into baby ducklings. The eggs will hatch on average within 26 to 28 days. Baby Indian Runner ducklings are able to fly within 5 to 8 weeks. Indian Runner Ducks will lay more eggs, when there is more daylight, that's why farmers will keep the lights on in the ducks house for longer periods of time. Indian Runner Ducks see in color with very good vision and can see well underwater. Indian Runner Ducks have three eyelids the third eyelid called nictitating membrane. They have a top and bottom as well as a third eyelid that is found on the side of the eye. The Indian Runner Ducks eyelid blinking acts as a windshield wiper to clear the eye. This helps to see when diving under water can also help the eye from drying out while flying. This is an act of constantly cleaning and keeping the eye moist. Ducks are related to geese and swans and the duck is the smallest of these birds with shorter wings and neck and a stocky body. Indian Runner Duck s on average, live 4 to 8 years and can live up to 12 years, depending on the breed. Indian Runner Duck s are omnivores; meaning - an animal that eats food of both animal and plant and origin. Many breeds of waterfowl are imported from America and Europe. The Indian Runner Duck also has high quality source of meat for those people looking for ways to improve their health. This has been the main reason why many people often like eating the Indian Runner Ducks as a way of improving their health. Indian Runner Ducks have webbed feet, that makes them act like paddles, designed for swimming. The Indian Runner Duck push their webbed paddle feet back in a kicking motion, this allows them to move swift through the water and when the feet come back, the Indian Runner Duck will close for less water resistance. The Indian Runner Ducks paddle feet do not feel cold, even when it swims in cold icy water. The webbed feet makes a Indian Runner Duck waddle instead of walk. The Indian Runner Ducks feet have capillaries which help blood flow to their feet. The warm blood flow down the leg and creates a heat exchange system. When the blood flows down the leg, it meets the cold blood and is warmed up to keep the Indian Runner Ducks feet warm. Indian Runner Ducks feet are thin because they contain soft tissue and few muscles. A special feature that the Indian Runner Duck has is its water-proof feathers, even when the Indian Runner Duck dives underwater, its downy under-layer of feathers will stay totally 100% dry. There is a special gland called the "Preen Gland" also called Oil Gland or Uropygial, that produces oil that is near the Indian Runner Ducks tail which covers and spreads the outer coat of the Indian Runner Ducks feathers, which makes the duck water-proof. An Indian Runner Duck is a Precocial (meaning) Born or hatched with the eyes open, a covering of hair or down, capable of a high degree of independent activity from birth and able to leave the nest just a few hours after hatching. A male adult Indian Runner Duck is called a (drake) and a adult female Indian Runner Duck is called a (hen). A young baby Indian Runner Duck is called a (duckling). A group of ducks is called a brace, raft, team, flock, or paddling. The male Indian Runner Ducks (drakes) are the brighter colored ducks while the female (hen) are usually a plain colored brown for hiding purposes to be camouflaged from their enemies when they are sitting in their nests. 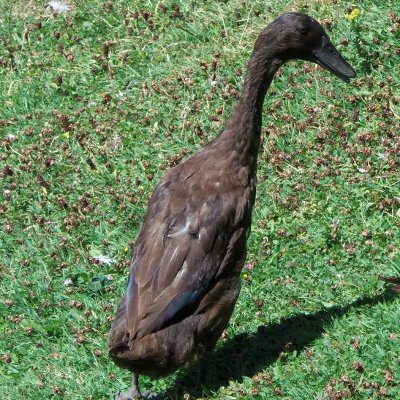 "Scientific name for Indian Runner Duck Anas Platyrhynchos" meaning - Wild dabbling duck from which domestic ducks are descended; widely distributed. From New Latin "anas" meaning (Duck) and the word Platyrhynchos comes from "platyrrhine", Ancient Greek meaning (broad snouted, flat-bridged nose). Ducks are birds in the Class of "Aves". Ducks of all types are part of the bird family "Anatidae". Ducks are also called "waterfowls" they are generally found in places were there is water, such as ponds, rivers, streams, lakes and occasionally your back yard pool. Underneath the water-proof coat are downy soft fluffy feathers which keep the Indian Runner Ducks body warm. Indian Runner Ducks keep clean by being able to turn their heads completely backwards, and put their beaks into their feathers by preening themselves. A "bill" is what is call a Indian Runner Ducks mouth. There are no teeth in the Indian Runner Ducks bill, they have rows of thin bristles, which helps them to filter pieces of nutrition out of the water. Indian Runner Ducks swallow there food whole and it goes to an organ called a gizzard, were the food is first ground up and than moves on to the stomach. The different bill shapes and sizes for finding food, has over time mutated to fit each environment. The bill is flat and broad and has rows of fine incision along the outer edge called "lamellae". meaning a thin membrane, plate, scale or layer, as of cell wall or bone tissue. The larnellae helps the Indian Runner Duck to clutch food for feeding.